What A Woman: The success and stillness of Azania Mosaka | thebar. The first time I saw her was in 2015, when I’d just moved to Johannesburg to start my ‘big time’ media career. I was peeking over my newsroom cubicle, hoping to catch a glimpse of the face that matched the voice I already knew so well. She strode past my desk on her way to see another journalist – and in one split second I saw the majesty of Nefertiti, remembered the first time I heard Nina Simone and witnessed a Deepak Chopra level of calm confidence. Azania Mosaka moves with an energy that shifts the whole room. The next time I would see her was a brief meeting before we sat down to our interview. At 5.30am at Nirox Sculpture Park, in the thick bitterness of winter, she walked into the glam room- and although older and less starstruck, I felt the same sense of awe as I did three years ago. And instead of a formal, question and answer, we sat down, sipped on rooibos tea and had a conversation. I was told I had just fifteen minutes – after all, Azania is a busy woman, with places to go and people to see. But she quickly halted the make up process, wolfed down a healthy breakfast and turned her attention to me. 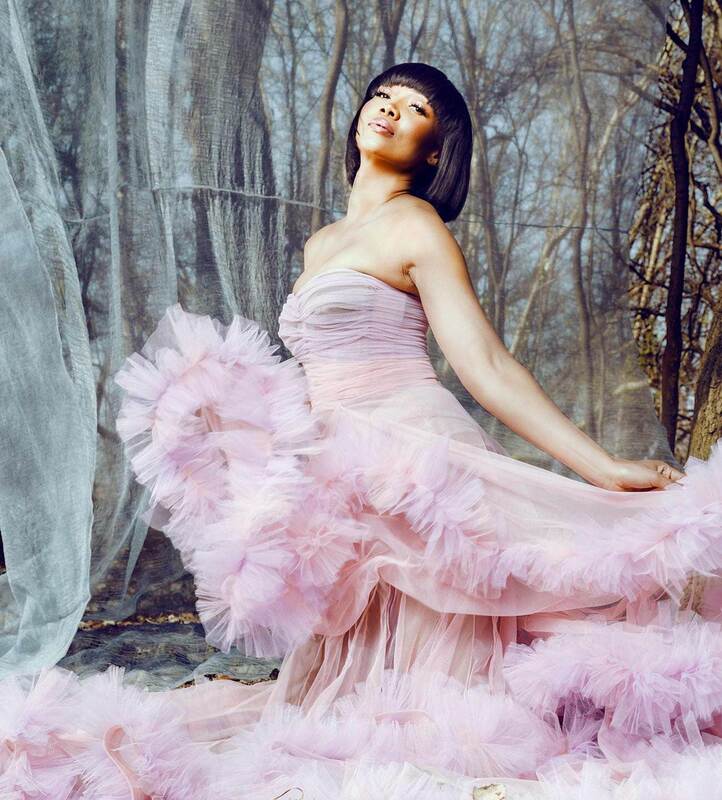 For younger TV and radio audiences, Azania is best-known now as the new host of SABC 3’s RealTalk on 3. Succeeding fellow radio-tv magician Anele Mdoda, Azania stepped into the role to much hype and interest. After all, for those who have watched the evolution of her career, this was yet another metamorphosis she had achieved – a dazzling butterfly who so easily captures our attention and our interest. When we sat down to talk about the show move, I was curious as to how she made sense of the new voyage. She paused, took a deep breath and briefly held her hands together in a prayer-like pose, like a monk in quiet contemplation. “If you’d asked me about that ten years ago, I’d have given a very different answer… Now, for me the success marker is about my personal development – how at peace I feel, how aligned I feel or in flow with my Creator, my purpose, my mission. Now my success is benchmarked around my state of mind and my state of peace,” she explained. This brief and poignant insight shifted our conversation fundamentally, and it quickly gained the texture of Oprah’s now-famous Super Soul Sundays . What became clear was that Azania’s career journey has drawn her deeper into herself, rather than further out into the public world – where viewers and listeners so often dine on and devour their favourite stars before their prime. While RealTalk on 3 seems to all of us like the axis upon which her new career chapter is spinning, it is a manifestation of a more important mission at hand. She works with celebrated integrated medical psychologist Dr Ela Manga on consciousness and mindfulness, starts her day with a guided meditation and unlike many of her contemporaries, ditched running for the quiet of a yoga studio. Self-care is less a passing Pinterest practice for her, and more a form of medicine. “Things can get very manic, and that’s what it was like, and then you realise ‘I actually don’t feel great,” she shared candidly. In the midst of this serious moment, which should be all about her, she switches gears into Mom mode, fixing my hair and removing a piece of lint from my dress. This small gesture typifies her warmth and awareness of others – despite everything on her plate. And this is where things get interesting. In an expose on so-called “knowledge workers” (those who use cognitive and practical skills to produce and analyse knowledge), an investigation by The New Yorker showed that increased technological connectivity, greater public visibility and high stress had a significantly positive impact on career prospects, and a significantly negative impact on self esteem. For Azania, whose career presence has spanned almost every major media house in South Africa, this logic seems to ring true; but she is now actively working to navigate the interplay of career noise and personal stillness. Later in the day, Azania effortless steps onto a floating plate, giving the image of a heavenly body, floating on water – the winter sun reflecting against her catsuit. It was the perfect embodiment of her unshakeable spirit. Despite her zen approach to her state of mind and a vehement belief in a higher power, Azania did not pull punches when it came to talking through some misguided moves in the past – and her struggle to let go of structure and strategy. I ask her whether having something to lean on makes things easier, and for the first time in our bubble of Buddha-like bliss, she is almost unnerved. Despite this struggle, Azania has been a darling of both radio and television, with an arsenal of accolades to rival any other personality working in the industry today. And while she could wrap things up today, the lure of the next challenge (more personal than professional now) is still a massive driving force. ‘Total Bliss’, her epic show on MetroFM was an important turning point. Despite its success, a new chapter was calling. “I would go in and we’d mastered it, I could do it in my sleep and I wasn’t challenged anymore,” she explains. “I felt I wanted to be part of driving dialogue in the country, conversations that are steering and I couldn’t do that you know?” Whilst all was great at the station Azania couldn’t deny her restlessness anymore. Azania’s 18-month stint at PowerFM was also a strong teaching moment, and, despite yet another round of immense (external success), there were elements that, in her words, spoke against Azania’s values – the engine that makes her sustainable success possible. So now she’s started to ask new questions and search for a gut-driven it – or what South Africans affectionately know as “that thing”. While I can’t say I share her enthusiasm for a massage or as she explained, having someone walk on her back, we were certainly united when it came to a love for Asian cuisine, tailored garments and some skepticism for humans heading to the moon. “My feet are covered in water – did you see that? My shoes are absolutely ruined,” she casually remarks, hopping out of the cart. Our theme for this launch issue is water, Azania’s willingness to get her shoes ruined for the sake of art highlights her unpretentiousness as she struts off as if without a care in the world. She has been freezing the entire time, but did not complain or interrupt our conversation. And I guess that’s the unique Mosaka magic – a quiet and timeless stillness that shakes things up, inspires and elevates, without saying a word. Azania moves gracefully deliberately, as if she isn’t carrying decades of success with her – nevermind the hopes of every aspiring on-air personality. It was a marvellous thing for me to watch as a black woman. We are so often taught to enter a room apologetically, to stand in the background or not to be so loud that someone recognizes the power within us. Not Azania, at least not the Azania of today. She has and continues to stand the test of time. She embodies the message Maya Angelou once shared with Oprah – “I come as one, but I stand as ten thousand”.